Enjoy a nice bottle of wine on a picnic or at the beach without having to worry about spilling your glass or the bottle! 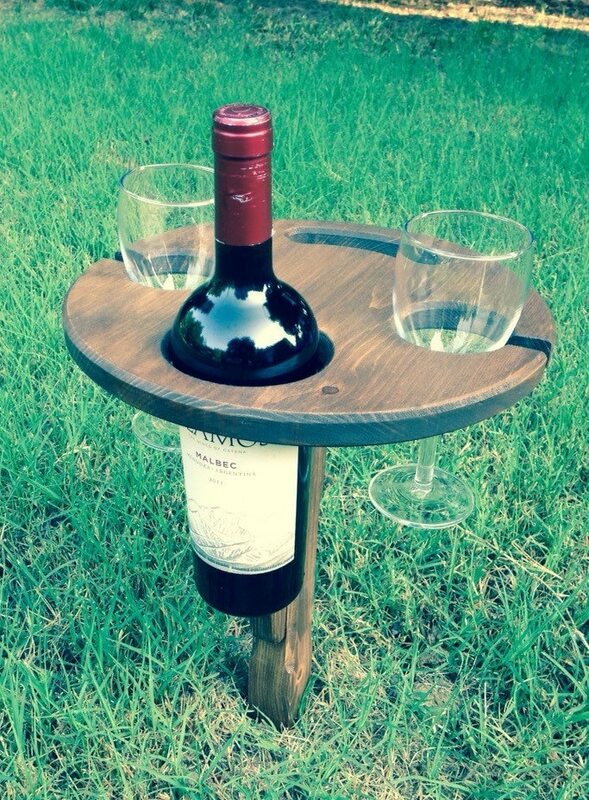 This design will hold two wine glasses and one bottle of wine. Each piece is hand made and designed and constructed for a rustic, rugged look. When you're done enjoying your beautiful day or night, the table easily folds up and packs away in very little space. A sturdy aircraft-grade aluminum spike on the bottom presses into the earth to support the table. If the color or wood doesn't quite suit your tastes, message me about a custom request. (Price may vary based on choices). Also, smaller holes for Champagne glasses are an option. Exactly what I expected, made a great gift! Great gift, did wonderful job with personalization.